Posted on Dec 22, 2010 at 15:37. Tags: conferences, pgday, pgeu, postgresql. 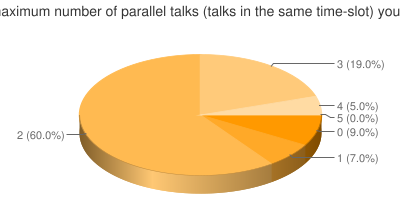 The next issue of my "pie-chart-overflow blog posts about PGDay feedback" is about our speakers. The speakers are, if that's not obvious, the reason that people come to the conference. Having good speakers is an absolute requirement if we want to keep up the quality of the conference. Other things like venue and price are certainly important, but nothing compares to the actual content of the conference - which is provided by our speakers. 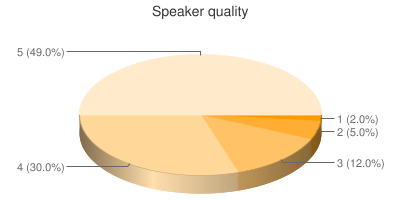 I'm very happy to say that we seem to have manage to keep the very high numbers for Speaker Quality that we had from last year (differing less than 3%25 which is well within the margin of error). The same goes for the scores our speakers got on their knowledge of the topic - indicating that we've managed to attract some of the most skilled speakers in the world. Which is not surprising given that in many cases, we the person speaking about a feature is actually the guy who wrote it. What is more surprising is that these same people are rated as very good speaker - which we all know isn't always true about your stereotypical developer. Just like last year, we're not going to post the complete list of speaker ratings, given that they are easy to read wrong. But here is a list of our top speakers, excluding any that had less than 5 ratings. Any speakers who have fewer than 10 should be considered a very uncertain number, and I've again included the standard deviation to determine the uncertainty. We had a lot more speakers this year, so I have only included those scoring 4 or above this time around. 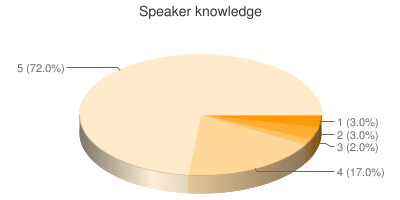 Each speaker has received his own detailed score, of course. A great big thanks to all our speakers - you did a fantastic job. We will need to work hard to keep up our recruiting of speakers for next years. If you were considering but decided not to submit a talk for some reason - please let us know why, so we can improve! Or if you have any ideas in general on our processes around this. For example, we had no female speakers at all this year - we know you're out there, and we certainly want you there, so what do we need to change to make this more interesting for you as a potential speaker? The same goes for other groups that we were missing of course: now is the time to let us know so we have the time to change things before next year! Posted on Dec 22, 2010 at 09:53. Tags: conferences, pgday, pgeu, postgresql. This blog seems to be turning into a PGDay blog rather than a general PostgreSQL blog. But I promise I'll get back to some more technical content soon - or at least that I'll try. A couple of days ago we closed the feedback system from PGDay.EU 2010, and have been busy tallying the result. It turns out that my constant nagging on people to please fill out the feedback worked - we got a lot more feedback this year than last year. That also means there's a lot more work in going through mainly all the freetext comments - that's the price I have to pay, I guess. 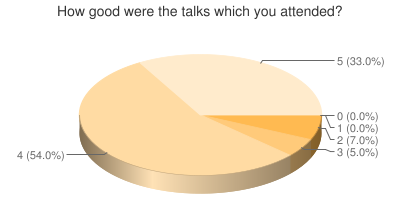 In total we had around 60 people who left "full conference feedback", which is almost double from last year. It's still only just over 25%25 of the attendees, so it could certainly be even better yet. We also had 86 people who left session feedback (this is around 40%25 and a much better number of course) for a total of 570 session feedback entries. Of course, the "Hallway track" is a very important part of any conference like this, and this year we collected specific feedback on this side. 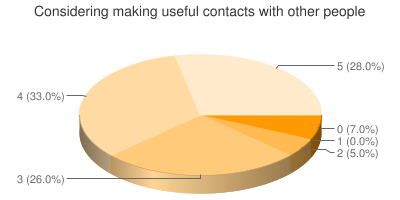 I'm very happy to see that more than two thirds of our attendees rated the learning part of the hallway track as 4 or 5, and well over half found it a good way to connect with other people in the community! 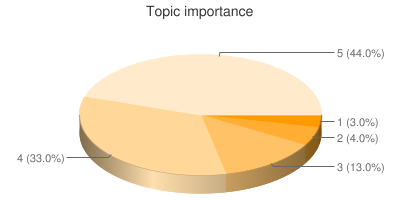 That's enough pie-charts for one post. I will follow this up with more feedback summary on our speakers and on our venue once it's ready. Posted on Nov 26, 2010 at 15:18. Tags: conferences, pgday, pgeu, postgresql. After today, November 26th at midnight, we will only be able to process creditcard/paypal payments, or cash payments at the registration desk. After 17:00 CET today, November 26, the pre-paid discounted internet access for people not staying at the hotel will no longer be available. Internet access is still included in your room rate if you book with the PGEUROPE group rate. Once this second deadline expires on the December 4th, you are still welcome to attend the conference - but in this case, you have to pay the higher price for a pay at the door registration. Even if you choose this, we do appreciate if you register online first (choosing that rate), so we can prepare a badge and conference pack for you. If you have any further questions, please contact us at contact@pgday.eu. 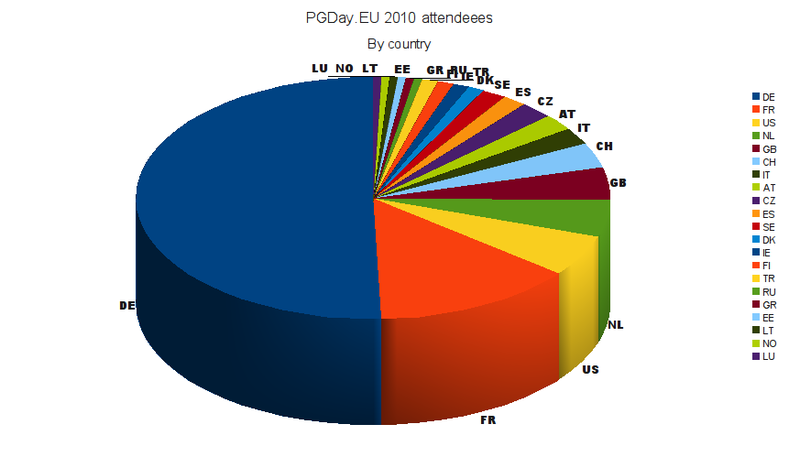 PGDay.EU - where's your country? Posted on Nov 25, 2010 at 10:25. 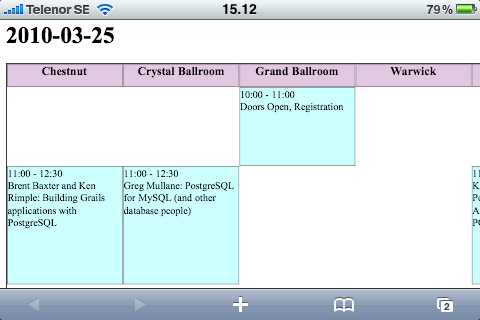 Tags: conferences, pgday, pgeu, postgresql. Initial numbers from our registration database for PGDay.EU 2010 is showing that we are expanding our international reach more than last year. In 2009, 60%25 of the attendees were from France, which is where the conference was held. This year the number of attendees from Germany is "down" to about 50%25, meaning we have more people from other countries. The total number of countries is down one though - we have no registration from Nicaragua this year! Even our attendance from the US is up to three more people. Registration for PGDay.EU 2010 closes soon! Don't miss out on the biggest PostgreSQL event in Europe this year, and all the great presentations! Posted on Nov 22, 2010 at 20:00. Tags: conferences, pgday, pgeu, postgresql. 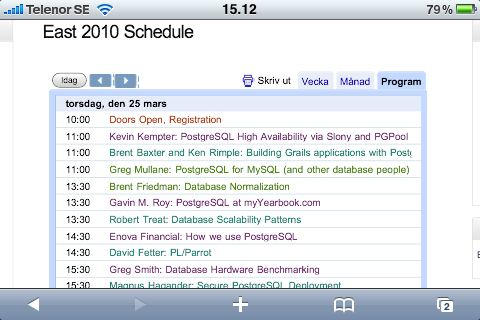 PGDay Europe 2010 is drawing closer - only two weeks until kickoff! Some of the training is filled up, but we still have space for some more people on the general conference (and some of the training sessions). It's not too late - go register! The keynote, of course. Simon Phipps is a well known and very experienced Open Source speaker and worker. He'll be talking about "Back to the Future of Open Source", and it will be very interesting to hear his perspective on this, having been on the inside of for example Sun. Play chess against PostgreSQL (and get beaten) with Gianni Colli. You just need to read the title, of course I have to see it :-) Unfortunately it's up against PgOpenCL, but that's what happens when you have so many good talks. I think I can skip out of Simon Riggs talk about replication - I need to have my class for Wednesday ready before this anyway. But I highly recommend it to anybody who is planning to deploy the 9.0 replication features. That afternoon I'll be busy with the conference, and won't get to go to any of the talks... I'll definitely miss the Concurrency talk, the clustering and the psycopg one. Tuesday, I can't quite decide between Developing PostgreSQL performance or Graph Constraints, and Why You Care. But we put two such great talks early in the morning to make sure everybody gets up! Next I'd go to Stefans talk about benchmarking, but it's in German, so I think I'm better off not doing that. It'll be the case-study of the large deployment that Bull did for the French social services instead. After lunch, I'm again stuck at doing work (sheesh). If you haven't seen it already, I recommend Bruce's MVCC talk. There are other good ones as well, of course, but Bruce does a very good "deep introduction" to PostgreSQL's implementation of MVCC. Obviously there's no skipping out on the closing keynote. Ed usually does a good job - I expect no less this time. And if you haven't registered yet, you still have a few more days. Don't miss your chance to attend the biggest PostgreSQL event in Europe this year! Registering is easy and quick - not to mention cheap! Posted on Nov 2, 2010 at 23:13. Tags: conferences, jdcon, pgwest, postgresql. Today is the first day of PG-West, also known as JDCon-west. After having about a week off to visit places and visit friends, I'm now back up in San Francisco for this conference, which will cover most of this week. It's a bigger conference than JDCon has been before - in most measures. It as more sessions than ever before - but you have to wonder who thought it was a good idea to have five parallel sessions. That's almost a guarantee that there will be more than one session you really want to go do. I'd rather have seen it in fewer tracks and spread over more time. It's also bigger in attendees than before. Last I heard it was at 203 or something like that - just over 200. That means that for the first time, JDCon is actually larger than a PGDay.EU (that had just over 190 last year) - I'm sure being in a great location in central San Francisco helps with that, along with the fact that the economy is in a better place now than a year ago. We're still in the lead over time (we were well over 200 a couple of years back), but we're also both well beaten by the Brazilians. It' sets a good target for us to work towards! The set of sessions looks really good, but as usual the hallway track is the one where much of the really good things happen. I missed this mornings tutorial sessions completely due to very interesting discussions outside. Hopefully the slides and notes and/or video will be available to look over once we're done. If you're tracking this from away, the twitter stream has some interesting comments - and will hopefully have more! Speaking of conferences - if you haven't already, now's a good time to register for pgday.eu. Particularly if you are planning to attend one of the training sessions - at least one of the sessions is already more than half sold out! Posted on Oct 19, 2010 at 13:10. Tags: conferences, pgday, pgeu, postgresql. It's finally time - we've opened up for registrations for PGDay Europe 2010. We are not finished with the schedule yet, so if you are looking for a specific talk, you'll have to wait a while longer. Work is in progress though - we've already notified some of our speakers that they are approved. However, if you submitted a talk and have not heard from us yet, it's not yet time to panic. The reason we haven't published a schedule yet is that we're working on ways to include more talks! So why would you want to go register now, even though the schedule isn't posted yet? Well, first of all, the schedule is looking like it'll be at least as good as last year. We have several well known good speakers from the community showing up again, and also some fresh faces with interesting topics! But more importantly, this year, we've added training for the first time. Training will run on the wednesday (the main conference being monday and tuesday). This training is limited availability (25 seats per session), and extra cost. You pay this at registration. And the seats are handed out on a first come/first serve basis. So if you want to attend the training, now is the time to register! The training schedule is final, so be sure not to pick two training sessions that run at the same time. The conference this year will be held at the Millennium Hotel in Stuttgart. We do recommend that you reserve a room with that hotel, as we have a group rate there, and it's conveniently located (hint: no need to go outside to get from A to B). But using this hotel is not mandatory - you can book your room anywhere you like. However, it should be noted that wireless internet is only included if you booked a room using our group rate. If you don't, you can pre-purchase the access when you register, or you can solve it yourself for example using 3G data. We will not have the ability to provide or sell you wireless access unless you pre-purchase it! With all that said, head off and register! Posted on Jul 22, 2010 at 17:57. Tags: conferences, pgeu, postgresql. PGDay.EU 2010 has finally been announced. It will be in Stuttgart, Germany, on December 6th to 8th. More details available on the conference website. We have also sent out our call for papers. 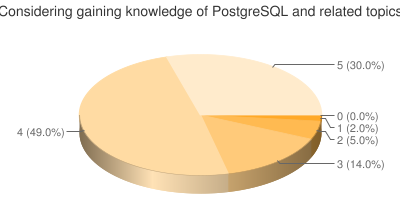 If you have done something interesting with PostgreSQL, please go ahead and submit a talk! We are currently looking for talks in both English and German!